Enjoy Santa Barbara Hotel's Historic Charm Classic touches of California Spanish Revival add to the historic feel of the Holiday Inn Express Hotel Santa Barbara. The hotel's historic property, also known as the Hotel Virginia and built in 1917, features Malibu and Catalina tile-work, exposed brick walls and wrought-iron railings, all in a convenient downtown location. With the hotel's location in Santa Barbara, the sights and sounds of the city are just steps away. Quietly charming, Santa Barbara boasts stunning Spanish architecture at sites like the Santa Barbara Courthouse. The beach and Stearns Wharf are only a few blocks from the hotel, while the Santa Barbara Zoo is about two miles away. Don't miss a chance to see the Santa Barbara Mission, known as the "Queen of the Missions." 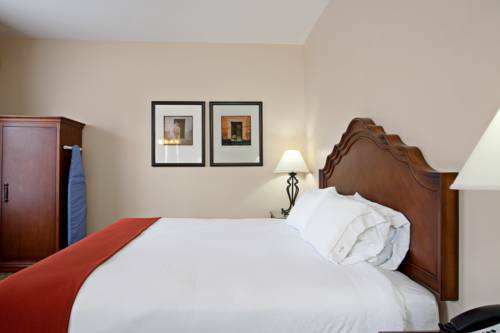 With free Wi-Fi access and a Business Center, corporate travelers find this downtown hotel is the perfect choice. Additionally, guests enjoy easy access to major area employers, such as the County of Santa Barbara, University of California, Lockheed Martin and ExxonMobil. Modern conveniences merge with historical touches to create a unique feel, and Santa Barbara vacations are made easy with amenities like the daily, free Express Start Breakfast Bar and free access to Spectrum Gym. Room service is available from Mesa Cafe from 11am to 9pm, and the second-level balcony entices guests to relax while enjoying spectacular views of the city. Call us today! Holdren's Steak House: An upscale steak house serving great steaks, seafood, and salads. Reservations are recommended for weekends. Wine Cask: Upscale restaurant located in the historic El Paseo featuring creative cuisine. Large selection of wines from on site cellar. Childrens's program - Family skate and bike rentals at the beach just half a mile away, only 5 blocks.